Lovers of theology, and particularly of the Puritans, will welcome this English translation of John Owen’s Latin writings. 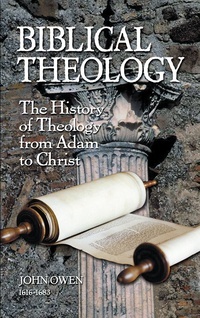 The major portion of this volume is a history of theology from Adam to Christ. Owen characterizes evangelical theology as a gift of the Holy Spirit generating faith in Christ, holiness through Christ, and worship of Christ. Appendixed to this important work is Owen’s Defense of Scripture against Modern Fanatacism, which is a defense of the authority and proper interpretation of the Bible against the subjectivism of his day. A jewel that still gleems! I was given Owens Biblical Theology as a gift. A great gift indeed, not only from the kind souls who gave it to me, but also from John Owen himself. In the mode of 'Biblical theology' Owen ponders may things that show the connectivity of the Scripture and expands on themes that have a moral, spiritual and cultural significance for us today. I recommend it to you as a book to read along side of your regular through the Bible reading.